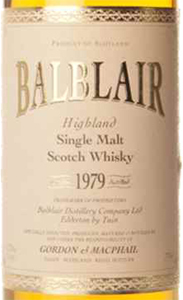 The Balblair Single Malt Scotch Whisky 10 Years Old by Gordon & Macphail is aged in American barrels for ten years. Warm and spicy, with citrus flavors, it is great to sip at the end of dinner, pure, or with the addition of 1/5 of water, to enhance its malted, citrus and floral aromas. 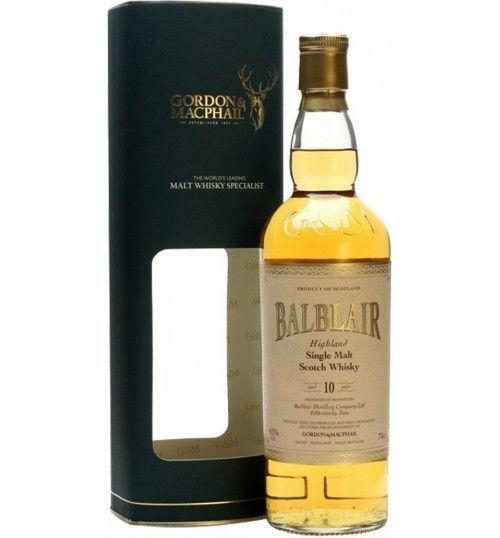 THE WHISKY The Balblair Single Malt Scotch Whisky 10 Years Old by Gordon & Macphail is aged in American barrels for ten years. Warm and spicy, with citrus flavors, it is great to sip at the end of dinner, pure, or with the addition of 1/5 of water, to enhance its malted, citrus and floral aromas. THE DISTILLERY The town of Elgin, in the north of eastern Scotland, is considered the "Whiskey World Capital". It is here that in 1895 Gordon & Macphail , James Gordon and John Alexander McPhail were founded. Their intuition was to combine the typical "drugstore" with the wine and liquor store, combining two distinct commercial activities and becoming, in the case of Whiskey, pioneers of the single malt market outside the highlands. Their choices became more than just a matter of fact: selecting and buying the best whiskey novels directly from the producer, then aging them in the best barrels and finally bottling them at the right time, Gordon & Macphail dominated the single malt market in the thirty years 1955-1985, recognizing his complex and elegant style. Today, the company, capitalizing on the excellent relationships it has established with all the Scottish distilleries, finds itself with an immense and diversified stock of whiskey in its warehouses, and continues to be present on the market with prestige and authority..
Before 100,00 € tax incl. Tasting Color: golden pale yellow. Aroma: fresh and sweet, with marshmallow notes, roasted malt flavors and, in closing, a light aroma of cooked pears. Taste: warm and spicy, with citrus flavors. Persistence is well defined. The town of Elgin, in the north of eastern Scotland, is considered the "Whiskey World Capital". It is here that in 1895 Gordon & Macphail, James Gordon and John Alexander McPhail were founded. Their intuition was to combine the typical "drugstore" with the wine and liquor store, combining two distinct commercial activities and becoming, in the case of Whiskey, pioneers of the single malt market outside the highlands. Their choices became more than just a matter of fact: selecting and buying the best whiskey novels directly from the producer, then aging them in the best barrels and finally bottling them at the right time, Gordon & Macphail dominated the single malt market in the thirty years 1955-1985, recognizing his complex and elegant style. Today, the company, capitalizing on the excellent relationships it has established with all the Scottish distilleries, finds itself with an immense and diversified stock of whiskey in its warehouses, and continues to be present on the market with prestige and authority..